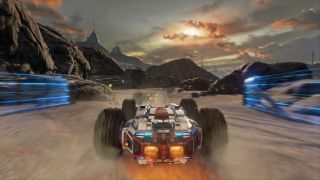 Grip, the combat racing game inspired by (which is to say, couldn't get the rights to) Rollcage, crashed and burned pretty hard on Kickstarter last year. In spite of that, developer Caged Element said the work would continue, supported by a home-grown crowdfunding campaign and, eventually, an Early Access release. And so it has. The early response on Steam seems quite positive, with 84 of 89 user reviews throwing it a thumbs-up. Steam reviews can be fickle, I know, but that kind of unanimity has to be a good sign; I haven't played it myself, but I do like the trailer. It (the game, not the trailer) will set you back $16/£12. Find out more at cagedelement.com.